No cooking, no dishes, no stress, and no meat. Eating vegan or vegetarian during the holidays is tough. Your options are usually meat and dairy heavy. Your friends and family who aren’t vegetarian don’t understand your dietary restrictions, so most of the time you have to piece together a meal from a limited selection of not-so-great choices. Picture yourself sitting down at the table with your friends and family, and you have a plate overflowing with traditional, mouth-watering fixings that are all vegan. You definitely won’t be going hungry this year. 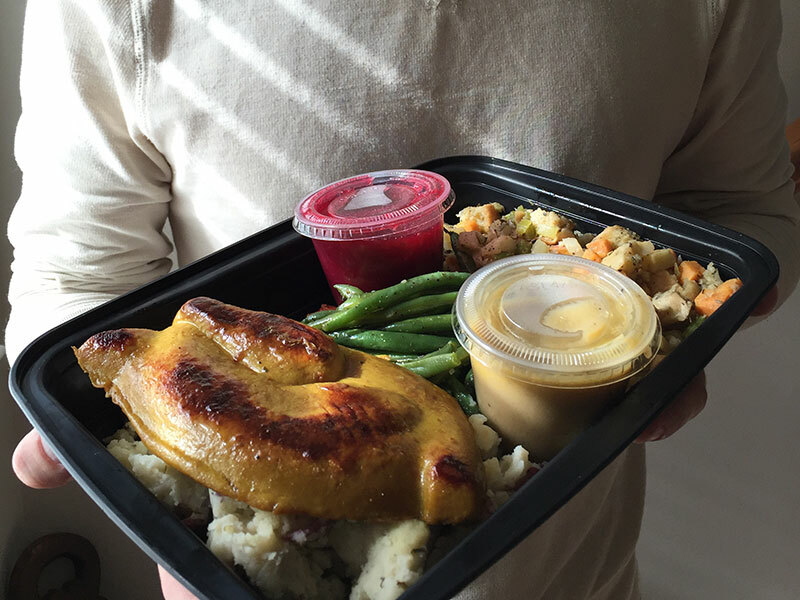 Once again, Cafe Sunflower is cooking up our revered all-vegan, dairy-free, take home meal for Thanksgiving. This feast is always enough for even the most voracious veggie lover. We couldn’t even fit the entire take home meal on this plate, but we took a picture anyway. It’s so good I CAN’T STOP EATING! And I’m full!!!! So glad I got two dinners…thank you! I won’t miss a year going forward! Thanksgiving dinner was great this year. Thanks Cafe Sunflower! A yummy plate of goodness, and not a salad in sight! Thanks, Cafe Sunflower, for the incredible food. You made vegan Thanksgiving for two perfect. I think this is the first time I did take-out for Thanksgiving. Cafe Sunflower came through like a champ! Choose to pick up from either the Buckhead or Sandy Springs location when placing your order. How many does one meal feed? The meal feeds one very hungry person. Why is the menu always the same?! Can’t you guys be creative and come up with something different? Most of our customers enjoy traditional Thanksgiving meals. If you’d like something different, you’re welcome to order something from our regular menu. Can I order only the Mashed Potatoes or Stuffing or Cranberry Sauce or…? No, the only thing you can order a la carte is the “Turkey”, but you’ll have to call us to do so. It’s $15 on it’s own. I have allergies, can you make something special for me? This is a big undertaking for us every year, and unfortunately, we don’t have the resources to accommodate special dietary needs. The entire meal is dairy-free and vegan. Additionally, the cranberry sauce, mashed potatoes, and mushroom gravy are gluten-free. Does the meal contain soy? Yes, it does. The turkey is soy-based. Why don’t you let me taste test before I order? Ummm, see the question above? Yah, it’s a HUGE undertaking. Just like when your mom (or family) would spend the entire day – or maybe even the entire week – cooking. We’re doing the same over here, y’all, for a couple hundred people! I didn’t order in time…now it’s the Tuesday before Thanksgiving what can I do? The cut off to order online is 9:00 pm on the Monday before Thanksgiving, and we SELL OUT every year. So get yourself on our email list, cause you’ll get plenty of reminders about it next year. Will Cafe Sunflower be open on Thanksgiving Day? We won’t be open on Thanksgiving Day since we take the day off and spend it with our families. We’ll be cracking into our take home meals too! We’ll be open the Wednesday before and the Friday after Thanksgiving. Our holiday closings are posted for each of the Buckhead and Sandy Springs locations. 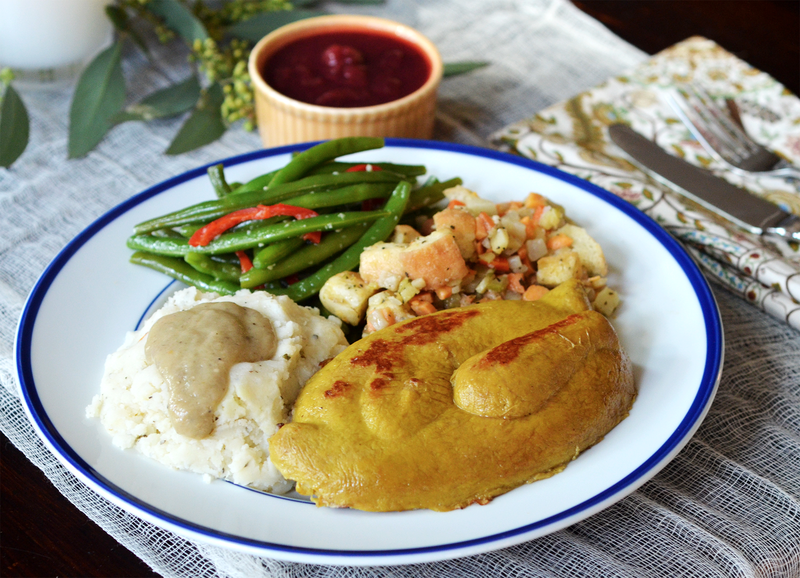 Thank u @CafeSunflower for making #thanksgiving delicious with your all #vegan meal. I’ve had 2nds & there’s still more! The meal was incredible. My brother surprised me with it when I came down here to visit. Thank you for the excellent dinner! Everything was really good! We loved it! Happy Thanksgiving! Thank you @cafesunflower for helping make our Thanksgiving easy and delicious!